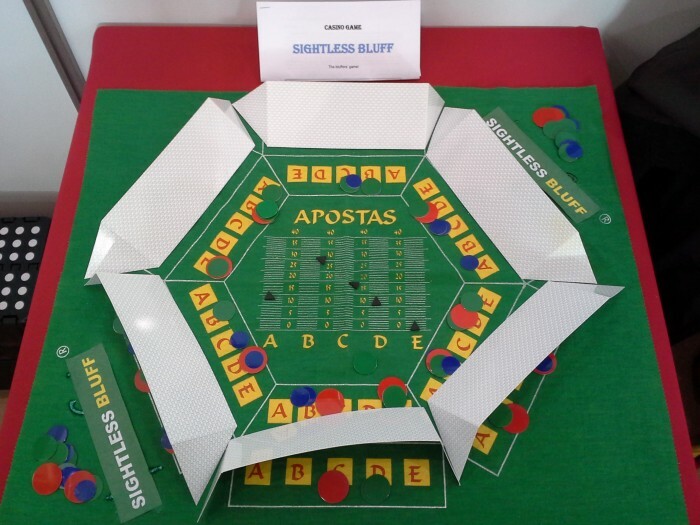 “Sightless Bluff" is a new board game - a casino-type game (maximum of six players) - a bluffers’ game - where players have a limited budget and try to survive to the end before other players go bankrupt. THE FIRST CASINO TYPE GAME EVER THAT DOESN’T DEPEND ON LUCK! This game’s decision making mechanism does not depend on chance, as cards, dices, roulette, etc! The player’s results depend on his own decisions, for it is he who builds his own "hand", through the value of his bets and according to his strategy and intuition! It was designed to be as much fun as possible to players as it does not have any decision-making mechanism that relies solely on luck, such as cards, dice, roulette, etc. In fact, the player’s results depend on his own decisions, as he builds his own "hand", through the value of his bets and according to his strategy and intuition! Thus, players’ intuition is a key factor! Why is this game unique? The player’s results depend on his own decisions as the only decision-making factor depends on the number of chips bet by the players in each of the 5 sections (A to E) that exist in each of the two zones: visible (public) zone and invisible zone (this is the zone under the cardboard protection of each player). After all bets are placed, and all the 5 sections chips as been counted up, these totals will determine the winning and looser sections and the corresponding allocation of the two prizes for each round, with two completely disparate criteria for awarding those two prizes! So, nobody knows what type of goal each player is seeking! •	Being able to play a game where the player feels his results will depend essentially on his own decisions, through the value of his bets! Lack of luck won’t be an excuse anymore! And so, when a player wins, he’ll feel that he’s entitled a certain merit. The patent being sold is just for the board game. The casino version could also be a part of this deal, to be negotiated. Why would this game be an interesting project for a casino? •	Possibility to extend the supply line of the games and services offered, benefiting from the corresponding increase in revenue and also in the number of customers; because everybody knows that most players are naturally curious and love to experience original sensations and test new potential sources of revenue. Business model: The format and rules of this game are part of a business model logic in which customers pay a certain amount to the casino to play a tournament/game and they also receive a set of gambling chips to play it. That is, the Casino is a service provider, and never risks any money in this model. Victorious players will receive prize money: a part of the total invested value. This a bit similar to what currently happens in many casinos where there are poker tournaments according to the No-Limit Texas Hold'em model, for example. I also have another project variant, protected and registered – that game is called Intuit – in a business model at which each customer will play directly against the casino, as it happens with Blackjack. Page created at 2019-04-26 5:55:56, Patent Auction Time.